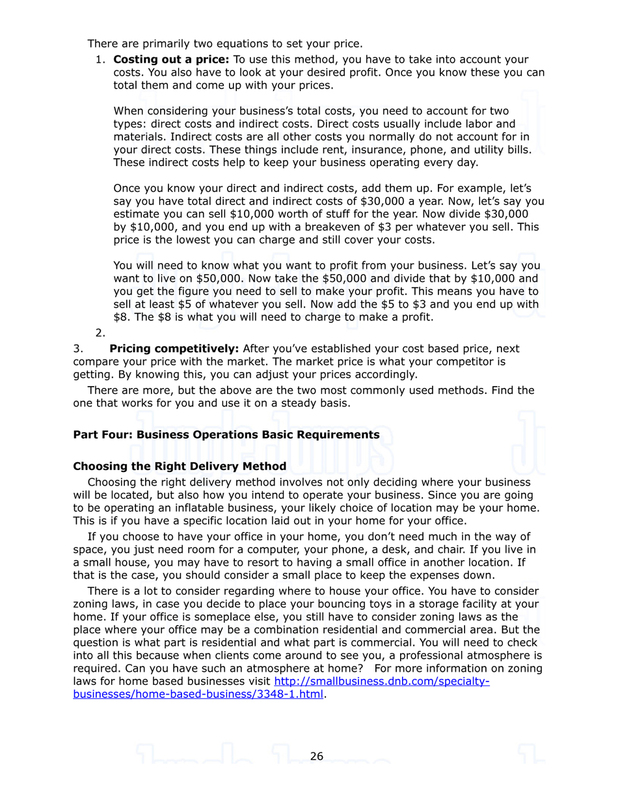 How to Set Your PricesIn order to determine your prices you need to first analyze and determine the pricing of your local competition. The best way to do this may be to make some calls to them posing as a potential customer. Get the details on their products and the pricing they offer. Keep in mind that you don’t have to undercut them and have the lowest price around, but your do need to be in the ballpark. Are your products comparable to the competition? If your products are of significantly greater quality then this is a great selling point that will allow you to make your prices a bit higher than the competition.You also need to make sure your costs are covered and that you are making enough to pay yourself as well. Analyze the start-up and monthly costs then add in your own salary. Estimate how many jobs you will have each month and use these numbers to determine your pricing. For the inflatable business you will need to consider hourly, half-day and full-day pricing. Also consider weekend versus weekday pricing. Will delivery and pick-up charges be add-ons or will this be included in the price?While it isn’t the optimal situation, you can change your pricing down the road. If you are not winning any business and the trouble seems to be your price you will need to re-evaluate things.For more factors to consider when setting your price visit http://entrepreneurs.about.com/od/salesmarketing/a/pricingstrategy.htm.There are primarily two equations to set your price. 1. Costing out a price: To use this method, you have to take into account your costs. You also have to look at your desired profit. Once you know these you can total them and come up with your prices. When considering your business’s total costs, you need to account for two types: direct costs and indirect costs. Direct costs usually include labor and materials. Indirect costs are all other costs you normally do not account for in your direct costs. These things include rent, insurance, phone, and utility bills. These indirect costs help to keep your business operating every day. Once you know your direct and indirect costs, add them up. For example, let’s say you have total direct and indirect costs of $30,000 a year. Now, let’s say you estimate you can sell $10,000 worth of stuff for the year. Now divide $30,000 by $10,000, and you end up with a breakeven of $3 per whatever you sell. This price is the lowest you can charge and still cover your costs. You will need to know what you want to profit from your business. Let’s say you want to live on $50,000. Now take the $50,000 and divide that by $10,000 and you get the figure you need to sell to make your profit. This means you have to sell at least $5 of whatever you sell. Now add the $5 to $3 and you end up with $8. The $8 is what you will need to charge to make a profit. 2. 3. Pricing competitively: After you’ve established your cost based price, next compare your price with the market. The market price is what your competitor is getting. By knowing this, you can adjust your prices accordingly. There are more, but the above are the two most commonly used methods. Find the one that works for you and use it on a steady basis.